Lazy Sunday afternoon. Boy, o, boy. Could the Beatles have been more wrong? Got up real early, enjoyed a rather modest breakfast, went back to the room to have a look at the different brochures of the city. I had just picked my first one as my Indian colleague calls me. It seems he and another colleague have been doing some planning. I'll be picked up at 2 AM. That leaves time for some exercising, one extravagant lunch (next time I'm bringing the camera) and some more reading. At around 14:00 we leave the hotel and make our way to Kanjurmarg station. Lesson learnt: trains haven't got doors. You know it and yet it's odd. People get in and out, even the old ones, without much ado. Of course there's a lot of running and yelling but that seems to be normal. As we are in first class, my colleague has arranged an all train day ticket (bless him), there is actual breathing space. Who wouldn't want to spend the 170 Inr? 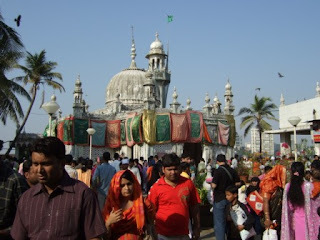 We ride, take other trains, a taxiriksja, some footing going on as well, subways to be taken (funny how kids around the globe all test acoustique) and arrive at Haji Ali's mosque. Many worshippers walk around with offerings for the tomb. They are not allowed (?) 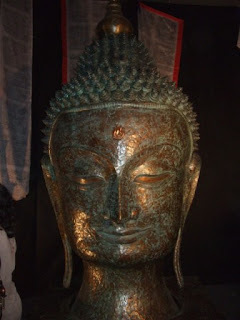 to put it on the tomb themselves, they just hand over the merchandize and it is then respectfully laid on the tomb. 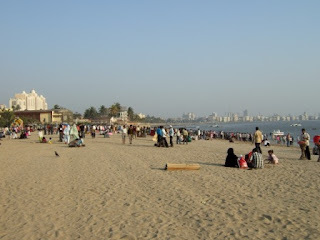 Later we walk to the Chowpatty beach. My colleagues agree that it is a good thing that now more beaches get the treatment that has been given to Chowpatty: it gets cleaned. Twice a day! Indeed. The beach is pristine. After having had an apple I feel the urge to toss it properly in a broken bin (the irony). Maybe the extra tanning will get my 'Whitest person in Mumbai' status removed. Let's hope so. Down the Marine Line we continue into the right leg of Mumbai and end up near Church Point. 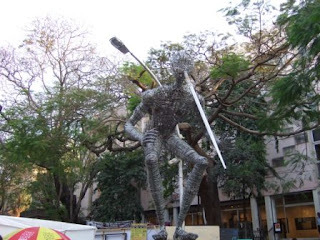 Turns out to be the last day of the Kala Ghoda Art festival. 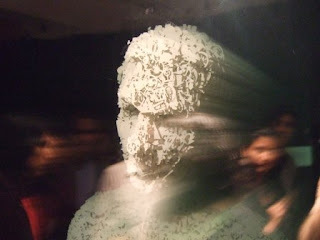 Strolling past all sorts of funny constructions and we continue into the Jehangir art gallery. The last parts of our evening are rolled out: a tour in an open bus and dinner. The bus is easily found. You get a ride for free you get a ride and a guide adds the extras, thanks to the festival. Perfect! Enough time for a quick coffee. Now there's a subject for discussion. I lose or rather willingly submit myself to trying a typical Indian coffee. Yeah. Ok. If you like creamy and extra sweet, forget the coffee: it's nowhere to be tasted, then an Indian coffee is what you need. If, however, you only have 10 Inr and need the caffeine… The upper deck of the bus is sold out! Not that that's possible, it was free but no more space above. Too bad. I'm stuck below. Taking pictures is not an option. The windows only open from the lower site up efficiently taking away the only part that was any useful when taking pictures as I'm sitting quite high. But suddenly, an older farangi comes down to take pictures from the front of the bus. Some antisocial behaviour (it's not as bad as it sounds) and a lot of prehaggeling by my colleague (now there's a pit-bull) gets me on top of the bus. Our guide informs us about the various structures clearly marking the many Art Deco buildings. And they are many, and they are beautiful, but worn in different degrees. As the ride continuous it becomes obvious that our guide missed her vocation. She starts asking questions. Testing us if we've been keeping track. When too little heads are going left and right she asks if we've fallen asleep! The last bit of the rant is that you cannot use the following phrase in every sentence if you're a guide:"you know?" Well lady, we don't! Sorry. That's why we're on the bus!? We all have a good laugh over this one and head for a beer. That would turn into an exercise in patience. We wait outside the bar, and wait. To cut this short, we get in losing at least half an hour what was promised to be five minutes. Indian time? Gladly, we fix ourselves to the table ordering water and Kingfisher, a light and refreshing ale. The food arrives on time, "it's good but not special" (from the Noodle menu: "Leopold special dish"). It's late, we're tired, we're moving. 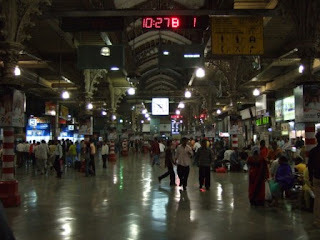 At Victoria station, no, not Victoria station, it's Chhatrapati Shivaji Terminus nowadays. Learn the name by heart! Almost everything gets renamed after the old ruler and founder of the Maharatha empire. 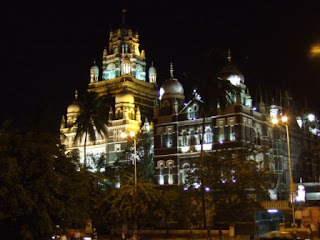 Just ask for the Chhatrapati Shivaji euhm museum and I'm sure that's you'll be pointed in the right direction. Wait, isn't that the formerly Prince of Wales museum? The trains are now deserted (23:00). A tuktuk rides us bumpy past the construction works back to my hotel. A delightful day. good pictures man! Did you took a swim? Nice to hear you enjoy mumbai. take care, and be aware of seeing too many bollywood movies! !